Fall in San Diego is measured by the arrival of pumpkins, not changing leaf colors like most areas of the country. For those who miss out on that festive, autumn feeling, there are many ways to give your home an autumnal look. Pumpkins, a fall seasonal staple, are great for carving, but they can also be used to create a unique fall décor. When most people think of fall, no matter the temperature outside, warm colors such as red, yellow and orange come to mind. These colors are a guaranteed way to bring out the desired seasonal style. Colors like brown and purple can be included for accents. 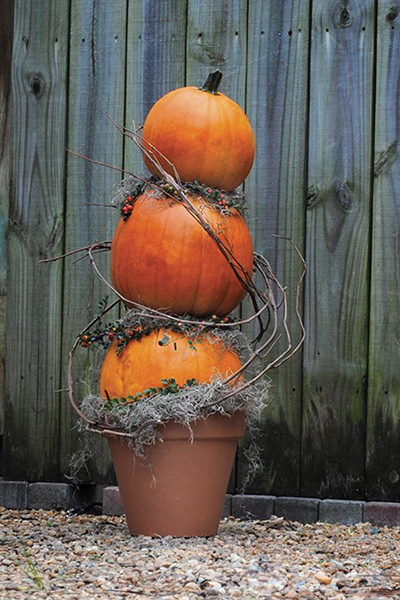 For a unique take on a fun fall topiary, try stacking pumpkins of all sizes. Start by choosing three or four varying sizes that are somewhat flat on the top. Traditional orange pumpkins or heirlooms like the Cinderella or Ghost pumpkins work well. Select a container that is slightly smaller in diameter than your largest pumpkin. Rest the largest pumpkin on the rim of the container, then begin stacking the next biggest directly above it and finish with the smallest pumpkin on top. Fill in gaps with moss or fall leaves. For extra support, insert a sharpened wooden dowel through the middle of the pumpkins with a mallet. Container gardening is a popular way to create beautiful seasonal color. 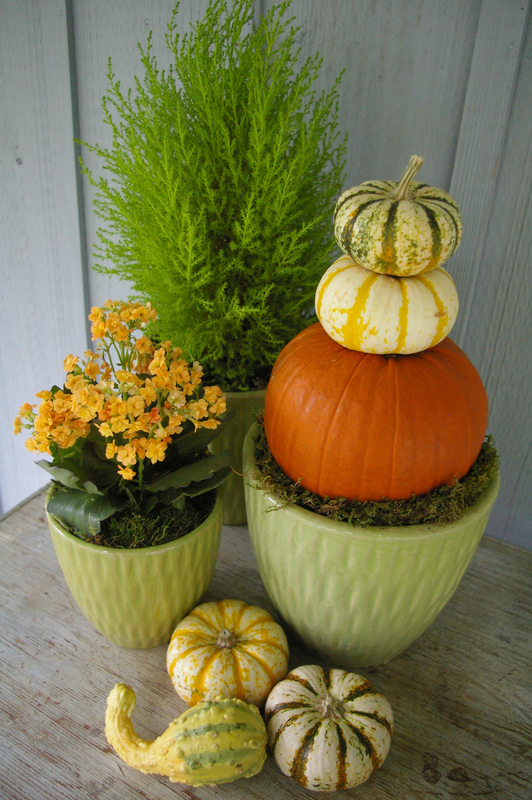 Medium and large pumpkins make perfect containers to be used as decorations for Halloween or Thanksgiving. Simply cut off the top, scoop out the seeds and coat the inside of the pumpkin with petroleum jelly to help slow down the decomposition process by keeping moisture from seeping into its flesh. Fill the pumpkin with a one or two-inch layer of fine charcoal to absorb moisture. Then fill the pumpkin half way up with potting soil. Croton, a mum or two, ornamental peppers and golden variegated ivy work well together all season long. If desired, try any five or six plant combinations that you like. Arrange them however you want and fill gaps between the plants with more soil. Lightly sprinkle water and you are done. 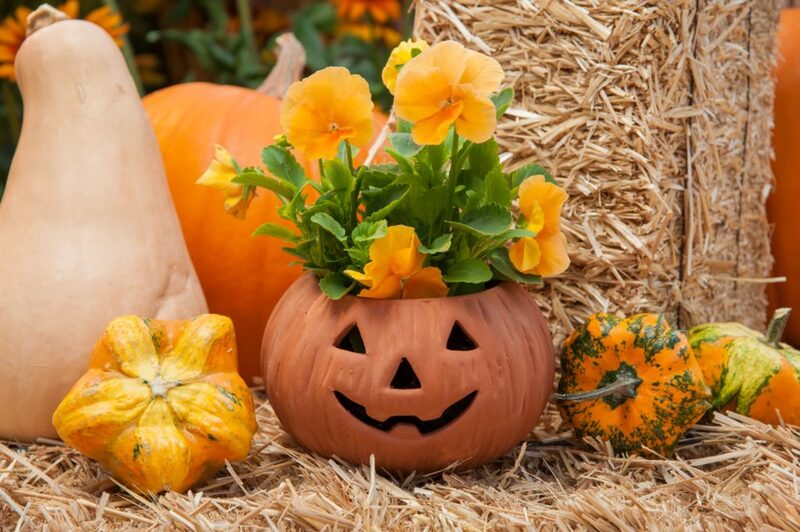 A pumpkin planter is a very low-water container that can last 10–12 days. It can even be planted in the garden when the pumpkin begins to turn soft. If you do not have a container handy or want to avoid making a mess, there are some rather simple ways to dress up a pumpkin. Grab a pair of black lace or fishnet stockings and drop the pumpkin in a leg of the stocking all the way to the toe. Cut the fabric, leaving extra material above the stem and tie off the top of the stocking at the base of the stem. Finally, cut the extra fabric into strips that resemble leaves. Another option is to paint the stem of the pumpkin black or the entire pumpkin another color before putting on the fabric. Try a light bronze or gold metallic for an elegant look. Are you short on time? Try a tumble of gourds and small pumpkins as a centerpiece for any dining room table. Another quick solution is to lay an autumn wreath flat on a side table with a small pumpkin resting in the middle. Feel free to share your favorite pumpkin designs with us. We might include some of them in a future issue of Mission Valley News/Mission Times Courier. —Gary Jones is the chief horticulturist at Armstrong Garden Centers, which has locations on Friars Road and Morena Boulevard. Email your drought and gardening questions to growingdialogue@armstronggarden.com.